Jesus drew large crowds as He preached throughout Galilee, healing many who sought His help. What was the reception when He visited His hometown? St. Mark tells us that early in Jesus’ ministry in Galilee, He visited His “native place.” Everywhere He went, He left a trail of “utterly astounded” people (see Mk 5:42). However, when He arrived at the synagogue in Nazareth, the reception was decidedly different. His preaching “astonished” those gathered, but their amazement moved in a surprising direction. “Where did this man get all this?” They were not impressed that one of their own had great wisdom and wrought “mighty deeds.” No, they were skeptical that someone they knew so well, someone whose whole family was well known to them, could suddenly show up and claim to be Somebody. In fact, His remarkable change from being simply “the carpenter” to a miracle-working prophet was just too much for them. They flat out didn’t believe Him. Consequently, He was only able to cure “a few sick people,” because there was no one else who asked for His help. Jesus knew He was taking His place in the long line of prophets in Israel’s history, each one of which was “not without honor except in his native place and among his own kin and in his own house,” yet the lack of faith in his Nazareth neighbors still “amazed” Him. Yet, that is the key. The Incarnation, foretold as early as Gen 3:15 (and that’s early), meant that only a human could be the One to make a difference for us. Only One like us, living like we do, could take our place in the work of reconciliation between God and man. The hardened human heart, full of pride and ego, resists this idea. Sinful man has bought into the devil’s lie that we are weak, fickle, and not to be trusted. That explains why the devil preyed on man and woman in the Garden. His strike against them would be his strike against God. However, it was God who dreamed man up, created him in His own image and likeness, and destined him for fellowship with the Blessed Trinity. Imagine the devil’s shock when he discovered that God would undo His enemy’s work through a woman and her Son. Through flesh and blood. Through the carpenter of Nazareth. We need to know about this human tendency to reject human salvation through human beings. We face it in our own day. We see the world’s incredulous reaction to the Gospel’s claim that Jesus is the only way to salvation and to the Church’s claim to be the sacrament of the salvation He won for us. The world, knowing our history so well, can’t imagine that God would be working out His miraculous plan of redemption through us. We see it in ourselves, too. Can God be answering my prayers for my salvation through my very human spouse? My human children? My human co-workers? Let us take this Gospel warning seriously so that it cannot be said of us that we have amazed Jesus by our lack of faith. Possible response: Lord Jesus, help me see You in the humanity around me. That’s always the last place I look. Perhaps these words gave Jesus comfort as He encountered Nazareth’s lack of faith. He was not the first to face this kind of resistance; He was also not the last. 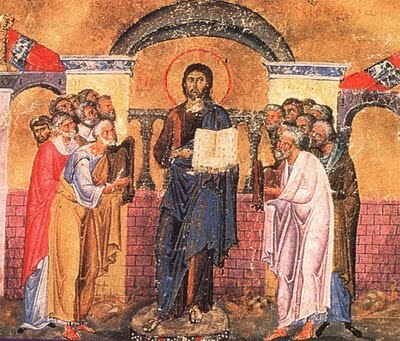 Recall that in the Sermon on the Mount, Jesus told the crowd: “Blessed are you when men revile you and persecute you…Rejoice and be glad…for so men persecuted the prophets before you” (see Mt 5:11). “Rejoice and be glad”? Is this possible? Possible response: Heavenly Father, I know I’m quite capable of being “hard of face and obstinate of heart.” Please grant me Your Spirit’s docility today. There is no better place for us than in this kind of humility and dependence. That is why Jesus told us in the Beatitudes to “rejoice and be glad” in our persecutions for His sake. In our next reading, St. Paul explains how we get there. In the epistle, St. Paul tells us about his own experience of finding God’s mercy to be adequate to our need, no matter what causes it. Here, he speaks of “a thorn in the flesh,” given to him to prevent him from being “too elated” over the “abundance of revelations” God had given him. We don’t know for sure what this “thorn” was—illness, some kind of personal failure, opposition from others, etc. We do know that God allowed the devil to use it against Paul. Did the devil mean it for good? No, the devil never wills the good, but God, Who is greater than the devil, sometimes allows evil in order to draw good from it (see CCC 268, 273, 1508). Can that really work? How counter-intuitive is this?? Yet, this is exactly what Jesus proved to be true, beginning in Nazareth, with the scoffing resistance of His neighbors, all the way to the Cross, when His own people had Him crucified. He became completely weak and utterly dependent on God—and He conquered! It turns out that the truly human way God has of saving the world is for us to live the truly divine way of self-sacrifice. We should never tire of pondering this; perhaps if we take it to heart, we will not take offense to it. Possible response: Lord Jesus, please teach me to be willing to be weak so that I can be strong in Your grace.